For saffron colour: In a blender, add the chopped/ grated carrots, red chilli powder, 1/4" ginger and salt and grind together as a puree and keep it aside. For green colour: In a blender, add spinach leaves, green chilli, 1/4" ginger and salt and grind together as a smooth puree and keep it aside. Divide the idli batter into 3 equal parts in different bowls. 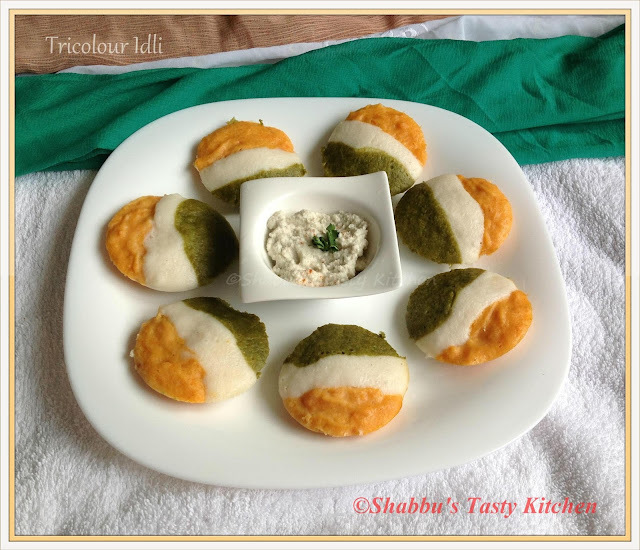 Add carrot puree in one bowl, spinach puree to another bowl and leave the 3 rd part as plain idli batter. In an idli cooker/ steamer , take enough water and allow to boil. Grease the idli plates with little oil and pour half tsp from each batter side by side till you the get the tricolour effect. Place the idli stand in the steamer, close with a tight lid and steam cook on medium flame for about 15 minutes or until idlis get cooked well.